Connecting retail businesses with e-commerce sites through Point of Sale software | A blog about smart POS software for independent small businesses. Connecting key data from a physical retail store with an e-commerce website run by the same business is a logical step for Point of Sale software. Such a connection enables the business to better manage stock, customers and the overall operation. The challenges of connecting two quite different businesses and technologies are considerable, as we have found out this year. We have developed such a connection, linking our Point of Sale software with e-commerce solutions. We plan to release this soon, once it has undergone robust testing in-house and in the field. The project has taken considerable time as we had to research the requirements and thoroughly fully understand the nature of data channels to various e-commerce software packages. The result is a unique facility, something exclusive to Tower Systems. We have deliberately not written or talked about this commercially valuable project before now to better protect our intellectual property and to retain for us the value of first mover advantage. As we are in a position to demonstrate the new facility we’re ready to announce our innovation to the world. No one can say they have what we have already since we have not shown anyone what we have. Our software development team is always innovating. The direction of this work is is a mixture of internal innovation, customer encouraged innovation and innovation from the leadership of the company. The result is better software and this is what attracts customers to us. We have loaded this free artwork, created by our in-house marketing team, to the downloads section of our website for our customers to use of their receipts. Our Point of Sale software makes it easy for our customers to serve the printing of images like this on receipts – making these business documents an extention of the retail store’s customer communication and marketing and therefore more valuable. The final hours of the weekend were shattered last night when we received a call from our security monitoring firm of a break in at our Hawthorn Head Office. When we arrived on scene we were greeted with a smashed front door and an office which had clearly been burgled. The police have gone over the scene and will be on-site eearly this morning to collect physical evidence. It will take us the best part of today to complete an inventory of equipment and business files to determine exactly what has been taken. In the meantime we have made arrangements to ensure that our Help Desk is operating not affected by this disruption to our business. Besides the obvious damage and theft, there is the considerable time cost of dealing with the police, our security firm, insurance and others as we get this sorted out. The smashed door was especially made and will take two weeks to be replaced. This means that our main entrance will look less than ideal through this time. Bookings can be made at the online training portal at our website. We have started rolling out our exclusive greeting card management initiative to newsagents using our newsagency software. Our beta sites are reporting good results. Both the retailer and supplier side benefit with easy access to valuable information with which to make better quality business decisions. On Monday, we take the roll out to the next step, bring more of our retail partners online with this initiative. This project will help newsagents make more money from their greeting card offer. Access to the new software and assistance for its productive use is part of the Tower AdvantageTM program. We are proud to be leading the newsagency channel on this initiative and bringing to newsagents facilities which are comparable to those relied upon by national retailers. We are thrilled to have successffully hired a new Help Desk team member. They start with us in a few days and head right into intensive training. We will introduce them through our newsletter and other channels once they start working with our customers. Smart retailers buy seasonal product five or six months out from the season. To do this with accuracy you need access to good sales data and the ability to identify sales trends for the season across years. Our POS software facilitates these comparisons and season specific analysis. This is why we have been thinking about Easter 2011 this week – we have been helping several new customer who have recently bought businesses our software to compare Easter 2010 with easter 2009 to come up with a projection for 2011. There is no substitute for good business data when making buying decisions. We happily work with our retail partners to analyse their business data in pursuit of better business decisions. It’s all part of the Tower AdvantageTM in action. In addition to connectivity to our Point of Sale software through an iPhone, iPad or any of the Android devices, our Retailer Mobile application software offers an excellent flexible mobile facility. Retailer Mobile is available by itself or packaged with a wireless enabled hand held PDA with in-built barcode scanner. This hardware and software combination make access to business data from just about anywhere. This is not just access but also live update for ordering and other facilities which can be used through the mobile software. We will provide software updates and support for Retailer Mobile free of charge for the first year. CASH IS KING! This is a vital mantra for every retailer, especially in today’s tough retail environment. Tools like our Point of Sale software and vitally important to measuring the cash contribution from management decisions made within the business. Our POS software has reports which measure the sales revenue and margin dollars delivered by products, categories, suppliers and departments in any period of time. This enables retailers to do before and after reporting, comparing the margin dollar contribution to the business of a move. We have seen this in action this week. One retailer made some significant moves and was unsure about the value to the business. In a few seconds we had the answer and they were surprised. The move was considerably more financially rewarding for the business than they expected. Had them been left to gut feel they would have thought the move was okay. Based on the facts we provided they are now looking more carefully at other moves they can make. Accurate measurement of the performance of a retail business is vital to retail success. While your bank account can show the cash you are earning, smart reporting like in our Point of sale software can prove exactly from where within the business the additional cash is being generated. Knowing what decisions are working for the business will improve the quality of the business decisions being made. In our training workshops and at other opportunities, we remind our customers that measuing every business move is vitally important. Indeed, we work with our customers on identifying the best reports for measuring various parts of their business. There is no special Christmas stock file from Hallmark this year. The current stock file (October 2010) lists Christmas stock. the latest Hallmark stock file has a new format. It is now a .csv file format. Our advice sheet G21 has instructions on proper importation of this file. 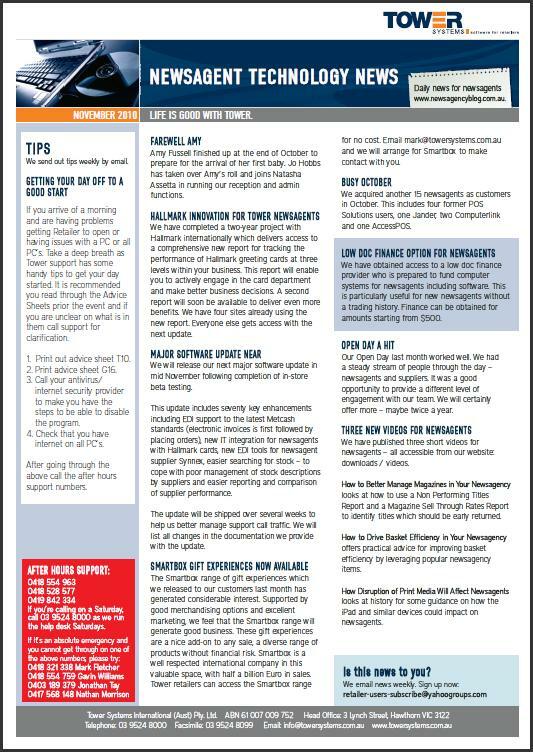 We have published our November customer newsletter updating our customers with news, sharing some support advice and detailing some innovation available through enhancements. We had expected to have stopped publishing a print newsletter by now but still find that enough prefer this monthly print reminder to warrant the design, production and mailing costs. We judge the success of the print newsletter based on customer feedback. In keeping with a tradition of many years standing, we will publish Christmas Retailing Tips again this year. All fresh ideas for our customers to consider for a bright Chirstmas 2010. 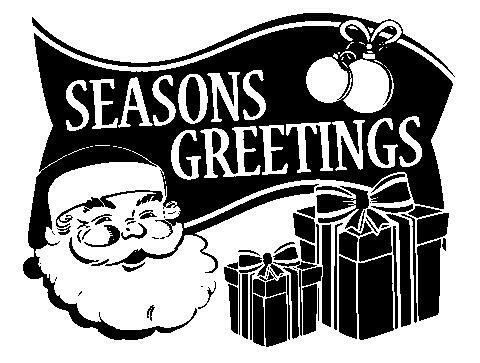 Our goal is to publisher the 2010 Christmas Tips for Retailers here next week. Our newspaper and magazine distribution software is now being used by another newsagent supplier to manage supply to newsagents. We are building a good community of newsagent suppliers as customers in addition to our 1,700+ newsagent customers. With each new newsagency supplier we bring on board with our newsagency software, we enhance our understanding of their needs as well as newsagent needs. We are able to leverage this into better solutions for both sides of the business to business relationship. Using our software, newsagent suppliers are able to create electronic invoices which make receiving and managing stock by newsagents considerably easier. We have tested and loaded the GNS 2011 Back to School catalogue file and the Newspower 2011 Back to School catalogue file to our website for users of our newsagency software to access. We are helping more of our Point of Sale software customers promote iTunes gift cards. The exclusive artwork is available for local printing. This poster artwork is one of several we have available from Tower Systems, to help our customers promote gift cards and electronic voucher product available from within our software. This is another free service from the Tower AdvantageTM program. We are interviewing today for a new Help Desk team member for our Melbourne office. Based on the work done reviewing candidates, we are confident of finding a candidate suited to our needs and the needs of our customers. We are hearing from retailers that Christmas 2010 is looking good based on sales over recent weeks. In many cases, sales are ahead of budget and up on last year – in high ticket and low ticket items. We checked in with retailers from several retail channels yesterday and they all reported positive feelings about Christmas sales. What is of most interest is the feedback from retailers who are not discounting. Their sales are as strong as those who are discounting. They put their success down to the retail chestnuts of excellent range backed by excellent service. We are pleased with the early Christmas 2010 feedback given the importance of the success of retail businesses on our business. Our Help Desk numbers will be lower than usual today as some of us will be attenting the funeral of Raul Rodriguez. We apologise if there is any inconvenience caused to our customers. We will be back at full strength mid afternoon. We don’t require our Point of Sale software customers to purchase hardware from us. We never have. However, we do require that hardware on which our software is to run meets our minimum specifications and is configured according to our standards. To facilitate achieving these two goals, we have maintained up to date advice on our website covering these specifications and standards. Every few months, we revise these to reflect any technology advances. By being transparent about our specifications and standards requirements, we help local hardware technicians get it right for our customers. This saves time and money all round. Security. Thursday Nov. 23 at 11am. Gift Vouchers Nov. 23 at 2pm. Help for former POS Solutions users. Thursday Nov. 25 at 11am. With more newsagents switching from POS Solutions to Tower Systems, this session remains a welcome and helpful transition resource. Importing stock files. Nov. 25 at 2pm. A strong community connection is vital to the health of just about any retail business. It can attract new customers, get shoppers spending more and help combat pressure on price. Community minded shoppers who feel they are doing good for their community by supporting a retail business will be more likely to support that business over a competitor. Thanks to the extensive customer loyalty facilities in our Point of Sale software many of our retail partners are better equipped to connect with their local community. By offering community group loyal shopper cards, retailers using our software are able to attract more business, track this and offer a rebate to the community groups promoting their business. This community engagement for retailers is vitally important to their businesses, the community groups they promote and the members of the community groups who access the offers available. Our approach goes way beyond the software. We help design and produce cards for passing out to community group members. This better connects the retail store with the community group and for local retailers such a connection is vital to business health. We have more details on this strategy which we are happy to share one on one with our customers. Network Services has advised that NW is not appearing on the W46 EDI returns form. They have asked that newsagents send this issue back as a supplementary. We have tested and loaded the latest Darrell Lea stock file to our website today ready for customer access. Smart gift shop software is helping gift shops leverage the opportunity of gift hampers this Christmas. Thanks to easy to use facilities in the software, gift retailers are able to assemble and disassemble hampers as needed and maintain inventory integrity through the process. The interest in hampers grows each year and more and more retailers are getting into this space to compete with the hamper specialist businesses. By educating our customers about hamper related facilities in our Point of Sale software, we are helping our retail partners leverage more business opportunities without extending their IT investment. Through this work we often see sales take off for items when they are packaged with other items. While most of this work is with gift shops, we are seeing it in all retail channels in which we work. With more jeweller suppliers providing electronic invoices for jeweller software we are pleased to be at the forefront in helping jewellers save time from this innovation. With several jeweller suppliers using our software, we are well positioned to help from the jeweller supplier end as well as the retailer end. Thanks to electronic invoices, jewellers no longer have to manually process invoices from participating suppliers. This saves time and improves the quality of business data. The natural flow on from this innovation is better quality business decisions. Across each of the marketplaces in which we serve – newsagents, jewellers, bikes, gifts, homewares, garden and convenience – we have active projects in place with suppliers to help retailers access the benefits of electronic invoices.